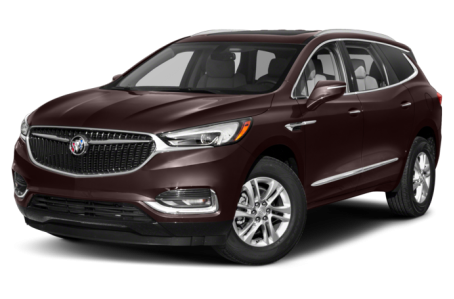 The redesigned 2018 Buick Enclave three-row SUV is slightly bigger than its predecessor but is nearly 400 pounds lighter, has all-new interior styling and features an updated V-6 drivetrain with a nine-speed automatic transmission. Offered in base, Essence and Premium trim levels -- as well as a new upscale Avenir version -- the 2018 Enclave arrives this fall. The redesigned Enclave rides on a slightly longer wheelbase and is about two inches longer overall than the already large 2017 Enclave. The new version's overall height is slightly lower, but new exterior styling makes it look considerably sleeker. The new grille and headlights create a stronger visual connection with the rest of Buick's lineup, while the prior model's porthole appliques on the hood have been ditched in favor of chrome flourishes on the front fenders. Eighteen-inch aluminum wheels are standard and 20-inch wheels are available. The focus on sleek styling carries over to the cabin where the new dashboard has a sweeping horizontal appearance and a lot fewer buttons than before. There's an 8-inch touchscreen multimedia system in the center of the dash that includes Apple CarPlay and Android Auto smartphone connectivity and a trial subscription of OnStar 4G LTE internet connectivity with an onboard Wi-Fi hot spot. The 2018 Enclave seats up to seven people on three rows of seats. A power-folding third row and a second-row seat that can move forward for better third-row access -- even when a forward-facing child-safety seat is installed -- are available. Standard features include keyless entry with push-button start, tri-zone automatic air conditioning, six USB ports, and a hands-free power liftgate with ground lighting that indicates where the sensor is located. A cabin air purifier and a Bose premium stereo are available. All models are powered by a 302-horsepower, 3.6-liter V-6 engine that drives a nine-speed automatic transmission. The V-6 incorporates stop-start engine technology to save fuel, and Buick-estimated gas mileage is 17/25/20 mpg city/highway/combined for front-wheel-drive models and 17/24/19 mpg for all-wheel-drive versions. The Enclave's standard towing capacity is 1,500 pounds but it increases to 5,000 pounds with a factory-installed towing package. Standard safety features include a backup camera, rear parking sensors, a side airbag between the front seats and GM's Teen Driver and Rear Seat Reminder features. Available features include forward collision warning, rear cross-traffic alert, lane departure warning, lane keep assist, GM's Safety Alert Seat and front parking sensors.